Elevators and escalators at the Dupont Circle station stopped running Tuesday afternoon due to a power outage, Metro said, amid reports on social media that the lights went out at three stations. Farragut North station was also affected by the outage. Dupont Circle's 20th Street entrance has reopened after a power outage that stopped escalators and elevators from running, Metro said. It's unclear if power has been restored. Passengers were told they could disembark at Dupont Circle if they could climb the escalators. Shuttle buses from Farragut North to Dupont Circle were requested for passengers who could not walk up the escalator. Metro will officially retire the 4000-series Tuesday. 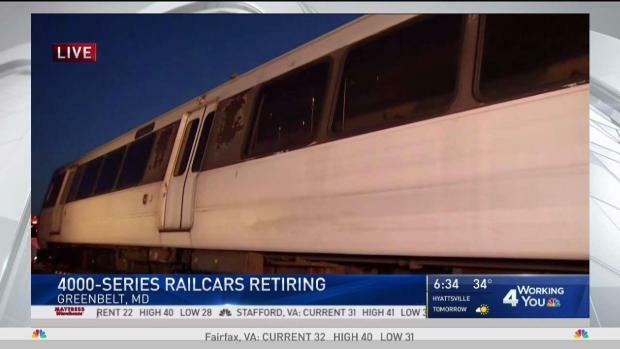 The cars are the system's worst performing rail cars, breaking down every 27,000 miles. News4's Adam Tuss reports. Metro blamed power company Pepco for the outage, but Pepco said they didn't have any outages in the area. Passengers reported on Twitter that some lights were out at the Gallery Place, Dupont Circle and Farragut North Metro stations. Metro said the Gallery Place outage was caused by another problem and resolved. Refresh this page for the latest details on this developing story.